Robert was born in Louisville, Kentucky on July 17, 1936. In 1954, after graduation, he went into the U.S. Navy. Robert and Betty married on December 22, 1955. He graduated from the University of Louisville with a Fine Arts Degree. He did Graduate work in the Arts and earned a Teacher’s Credential. Robert and Betty moved to California in 1968 with their four children, Maurice, Gordon, Rebecca and Jennifer. Robert taught at Encinal High School from 1968 until 2000. He taught ceramics, jewelry and lapidary to high school students and to adults. His greatest love in the Arts was Plein Air Painting. He painted for 60+ years. He loved to listen to classical music as he painted in his Art Studio which he designed and built. He spent many happy hours there. He and his family enjoyed living in Alameda. He was the “Love of Betty’s Life!” Robert was kind, generous and loving to All! 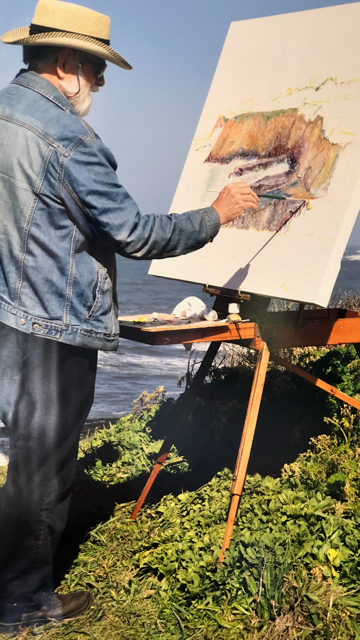 His life was Honored and Celebrated September 14-16, 2018 with a Plein Art Exhibit of forty-three paintings at the San Francisco County Fair building in Golden Gate Park. The paintings included a seven canvas painting, 28 feet long of Asilomar that is a 360 degree view of the Asilomar State Park and a twelve foot painting of the “Palace of Fine Arts, SF”. He loved to travel to New York and Paris to visit museums. Yosemite was a place he and Betty visited several times a year. Many of his paintings are from Yosemite area. and Abby; Janet and husband Mohamed; Dan and wife Cristina and children, Cassandra and Lucas. He had many honors throughout his career including Teacher of the Year in Alameda Unified School District, Alameda CA and served as President of the California Arts Education Association. He loved and lived well! He was a person who was loved dearly by his wife, daughters, sons and friends! He will always be with us! He passed away suddenly of a heart attack on Friday, September 7, 2018.
is the honor and recognition he would have wanted.